It’s been nearly 40 years since Nickelodeon began to entertain kids all over the United States. 25 years if you happen to live in the United Kingdom. Over that time, we have seen a massive amount of memorable characters born into the hearts of children up until this very day. It would make sense then, that video games containing such legendary cartoon creations would collide with the world of interactive entertainment. Over the years there have been many games pushed out into the hands of their cherished fans, eager to play the lead role in their favourite cartoon. It’s just unfortunate that most of them haven’t actually been very good. Bamtang Games has been handed the reins to make an attempt at another Nickelodeon take on Mario Kart. There have been several in the past, all of which have been pretty rubbish, to say the least. However, this one has the Teenage Mutant Ninja Turtles in it, thanks to Nickelodeon slamming cash on the table to buy out the heroes in a half shell. So, with a wallet as big as old Nick’s, and a legendary back catalogue to match, maybe, just maybe, this time, some care and attention may actually be put into this one. Or not. I’m just going to cut to the chase. Nickelodeon Kart Racers looks like a high school student’s first attempt at making a mobile app that they haven’t managed to finish yet. There is some potential in there, it’s just that there’s no personality, no vibrancy, every track pretty much looks the same and there’s not a single new idea to be found in sight. From the get-go, I had no intention to draw many comparisons to Mario Kart 8 Deluxe. That would be almost unfair, even against more well-known developers that have tried their best to compete with it. However, there have been kart racers beyond Nintendo’s insurmountable benchmark that have still proven to be very good. It’s a shame that Nickelodeon Kart Racers is far from being one of them. Even the name Nickelodeon Kart Racers is a very loose portrayal of what to expect. The only cartoons used for the dozen-strong cast are characters plucked from Hey Arnold!, Rugrats, SpongeBob SquarePants and Teenage Mutant Ninja Turtles. There are far more that could have hopped in a kart to compete. Where’s Rocko’s Modern Life, The Angry Beavers, The Ren & Stimpy Show, CatDog, Aaahh!!! Real Monsters and Pugwall? Well, probably not Pugwall… but still, you get the gist. The whole presentation of the game comes across as incredibly bland and nothing like what would be expected from the timeless children’s channel. Everything looks and sounds empty and soulless, like a depressed Chihuahua who’s completely lost the will to live. There’s no voice acting nor any music relating to any of the cartoons. What we’re left with is a collection of boring melodies that not only sound the same but are out of place, as if they have all been recorded through an empty toilet tube. What makes things worse, is that most of these complaints hit me before I had even selected a character, let alone started an actual race. The whole character select screen is squashed together off-center towards the right with nothing but a cheap purple strip plastered behind the cast. On the left, you get a good look at how hideously ugly both the character design and the kart is, as they lifelessly peer into nothingness with demonic dead eyes. There are 24 tracks to play through that apparently represent each cartoon. While tracks like Party Crasher and Birthday Bash send you on a tour around the Pickles household from Rugrats, many of the tracks found in Nickelodeon Kart Racers quickly hit you with a sense of déjà vu in how the tracks are simply the exact same environments that have been tinkered around with a bit. Each level has green slime that coats the tracks that you drive on. Driving over this slime will fill a boost meter and transform your kart into a hovercraft, but its constant familiar presence really hinders the diversity of each track. If the slime was such a prominent part of the gameplay, why not change up the colour every now and again. That way, every track in the game may not end up looking like the seweres in Teenage Mutant Ninja Turtles. Nickelodeon Kart Racers is obviously tailored towards children first and foremost. That can be seen in how there’s no regard for any form of quality in its design. Although, you wouldn’t think of it as child-friendly at times when the constant and ruthless rubber-banding rears its ugly head to ensure they barely have a chance. I will give credit where credit is due though, Nickelodeon Kart Racers isn’t an unplayable experience. Sure, there are more frame drops than the Chuckle Brothers in Ikea, but the borrowing of Mario Kart’s drift mechanic does make the somewhat competent track layout a bit more tolerable. There are options in place that tailor for the younger generation. Optional tilt controls, auto accelerate and easy drift can mildly assist a youngster when they want to get involved. As this is derivative of Mario Kart, weapons are a core part of the gameplay. As you would probably expect, each one is just a reskin of weapons that you have used in the Mushroom Kingdom with far fewer polygons and being nowhere near as interesting to look at. The only unique addition that I found was a giant wooden hand to block the path of those behind you. Of course, it doesn’t do a good job at keeping the CPU at bay when they just rubber-band right through it. There is some effort that has been made to change up the formula that would work better in their own modes. The old, eliminate the player that’s in last place after the timer expires is a throwback to Criterion’s Burnout 3: Takedown. While this could be seen as a desire to bring something different to the table, try telling that to a confused four-year-old girl who hasn’t quite made it past the finish line. Yeah, I know. She needs to learn to “git gud.” I said the same while dancing and gesturing a big L with my left hand in front of her adorable little cherry face. Believe it or not, there is some form of depth to the gameplay. You can earn customisations such as wheels and spoilers for the karts that apparently improve their handling and speed. However, I really didn’t notice much of a difference regardless of my choice. There are also two unlockable Grand Prix cups if you beat the others with tracks that are, thankfully, already unlocked in Freeplay for those who would rather play the courses individually. Unsurprisingly, there isn’t an online mode, leaving you with four-player local multiplayer beyond the single-player experience. 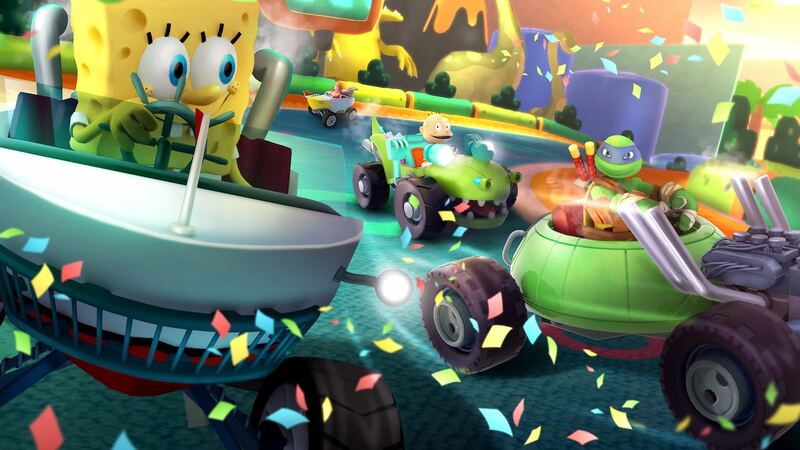 Nickelodeon Kart Racers also has three battle modes shoehorned in. These are made up of a traditional, weapon-based free-for-all, a capture the flag mode that loosely takes inspiration from Mario Kart’s Shine Thief, and a coin collector event called Tag that is much better to play with more than two players due to one kart dropping coins while the other players fight to collect them. Just like the single-player modes they aren’t particularly fun to play, but, at least, it’s nice to see some effort put into the multiplayer component other than simply enduring more races. One thing that’s worth mentioning is that you will be booted out to the main menu every time you have completed a single race, cup or battle mode. This becomes a massive of a pain in multiplayer due to having to re-sync the Joy-Con each and every time as a result. At least Rockstar Games won’t have much to worry about when Nickelodeon Kart Racers steps up to compete with Red Dead Redemption 2 this week. On the bright side, Nickelodeon Kart Racers is the kind of game you can buy for a nephew that you can’t stand. Just think. On the surface, his parents will give you brownie points for such an appealing looking gift. The nephew, on the other hand, will know full well that you have completely screwed him over. Furthermore, you can shamelessly watch in glee as he gets chastised for being an ungrateful and spoilt little brat after complaining about such a generous present. A win, win situation if you ask me, and well worth your money.